You can configure our chore systems several different ways. ​It will work great every time! Be sure to read all the *tips - you will get some great ideas on how to set it up for your family! I'll be adding more configuration ideas but this should get some ideas flowing for ways to set up your chart! Daily Schedule | Great for kids that need to know what to expect through out the day! 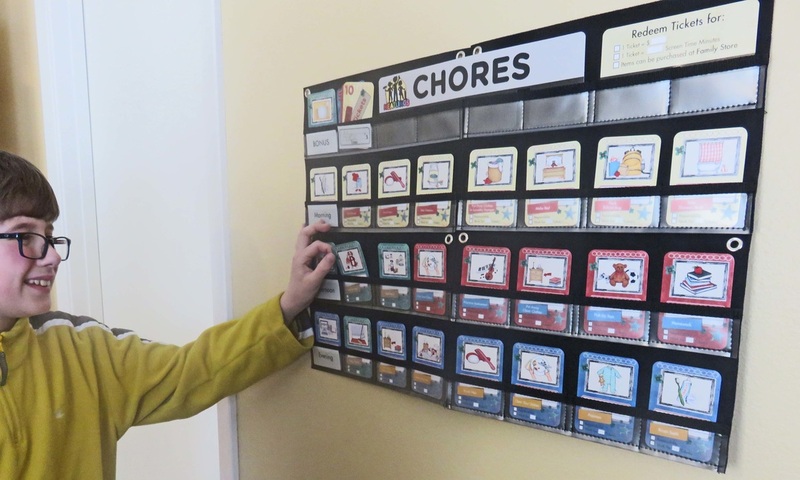 When using the NEATLINGS Chore Chart System for 1 child you can use the 3 colored self-care decks to identify Morning, Afternoon, and Evening Chores. 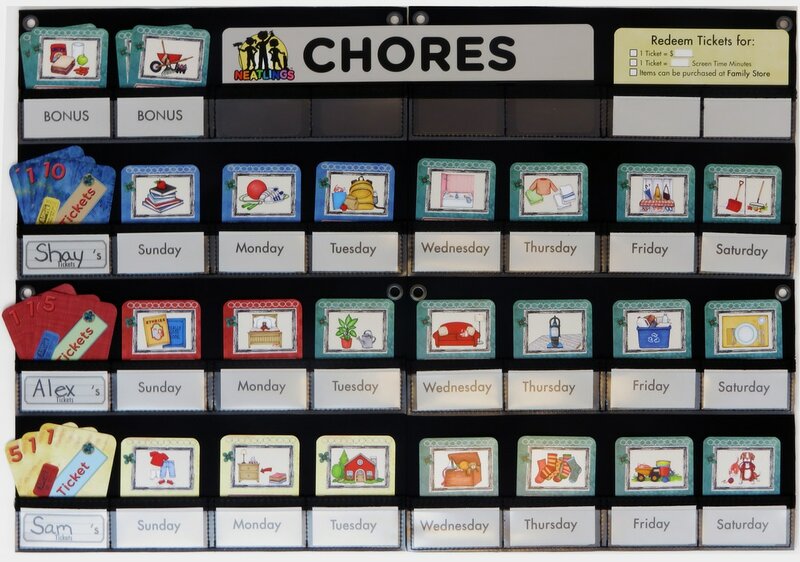 *Tip: Use the included blank chore cards to schedule other activities such art time, play time or regular physical therapy (PT). *Tip: Use the extra included pocket labels to set times for activities. For example instead of having a row for morning chores. You could list 7-8am for getting dressed, putting dirty clothes in hamper, brushing teeth and hair and 11am-noon for exercising & picking up toys and so forth. Time of Day | Great for a smaller space. Would work well for a child that is home during the day. Weekends, home schooled, summer break. *Tip: Offer to pay double tickets if all chores are completed for the day! 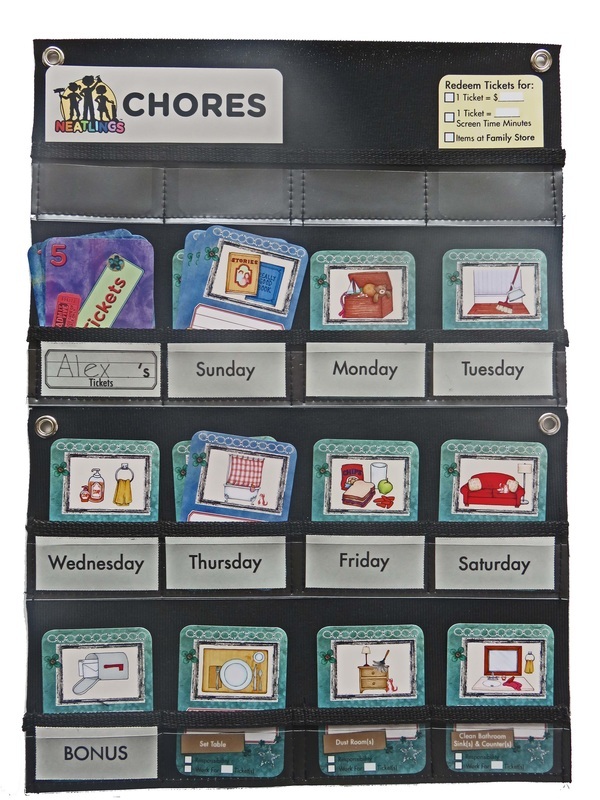 This will motivate your children to complete all their chores for the day - without nagging! With one child you can use all the self-care decks. This adds even more flexibility to the system! *Tip: Only pay for work for tickets when all responsibilities are complete. With a weekly chore calendar week you can schedule their household weekly chores in advance and then simply move their daily self-care chores from one days slot to the next as you move through the week. Bonus chores are the entire bottom or top row and can be changed each day when you settle up. *Tip: Only pay for bonus chores once all other chores are complete. *Tip: When a child chooses a bonus chore have them move the bonus chore to their row and have them turn it around when complete. Once complete they can select another bonus chore. This encourages them to complete one task before going on to the next. For three children. Short on space - you use this option on a narrow door. This option is great if you have children of various heights. Your littlest can still reach the bottom rows. Without having to have the entire chart really low. With chores by week you can schedule their household weekly chores in advance and then simply move their daily self-care chores from one days slot to the next as you move through the week. *Tip: Short on space the long version could be used on a cabinet front and both could be used on a standard sized door. *Tip: If you your children vary greatly in height then use the long style and let your littlest have the lowest rows. 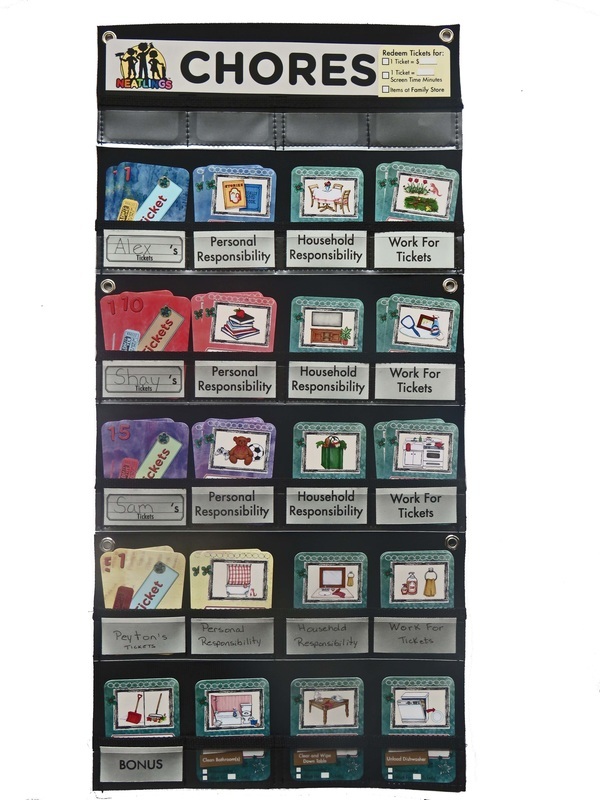 Chores by Responsibility | Will fit on standard size kitchen cabinet doors. Not a lot of room. Use a short narrow configuration. 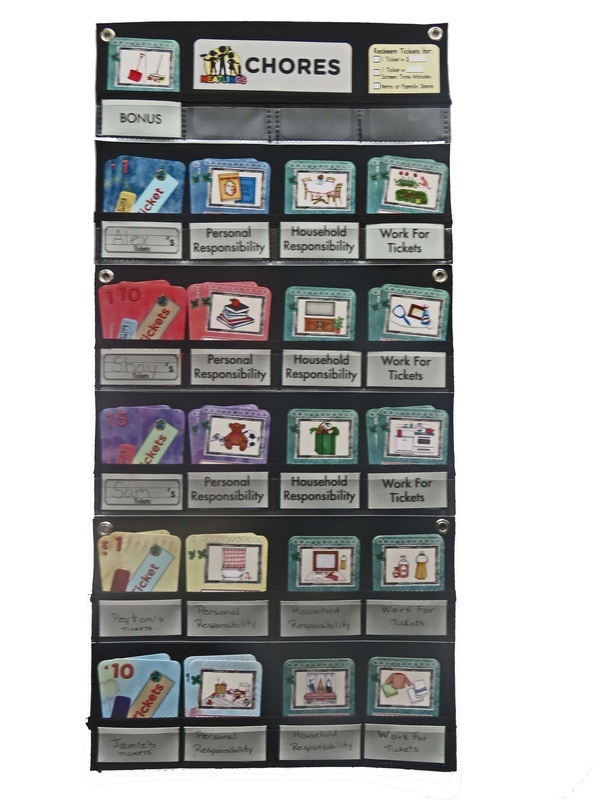 Great for instilling kids with personal responsibility and household responsibility. 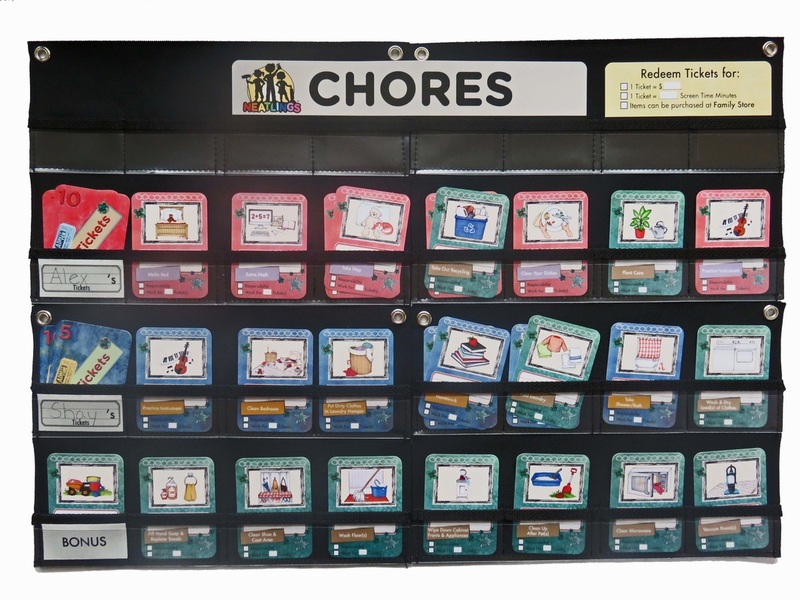 Also has a slot for chores that each child can earn tickets for. 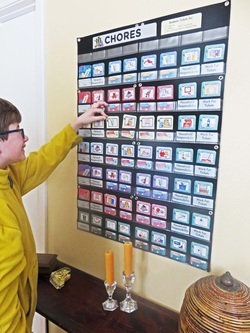 This works great if there are certain Work For Ticket chores that you want to have specific to each child. 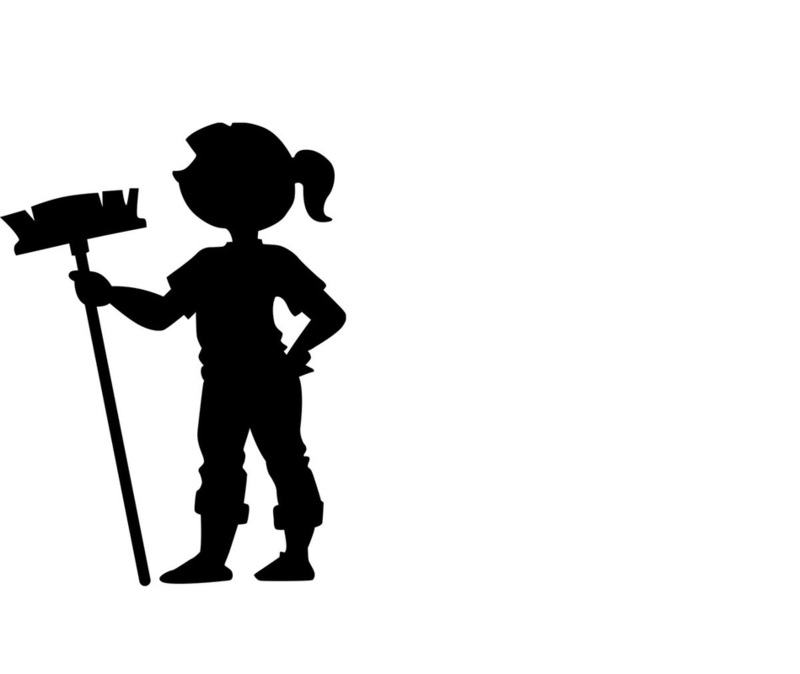 For example: Let the youngest have some age appropriate tasks like picking up sticks in the yard while an older child might clean the bathroom. 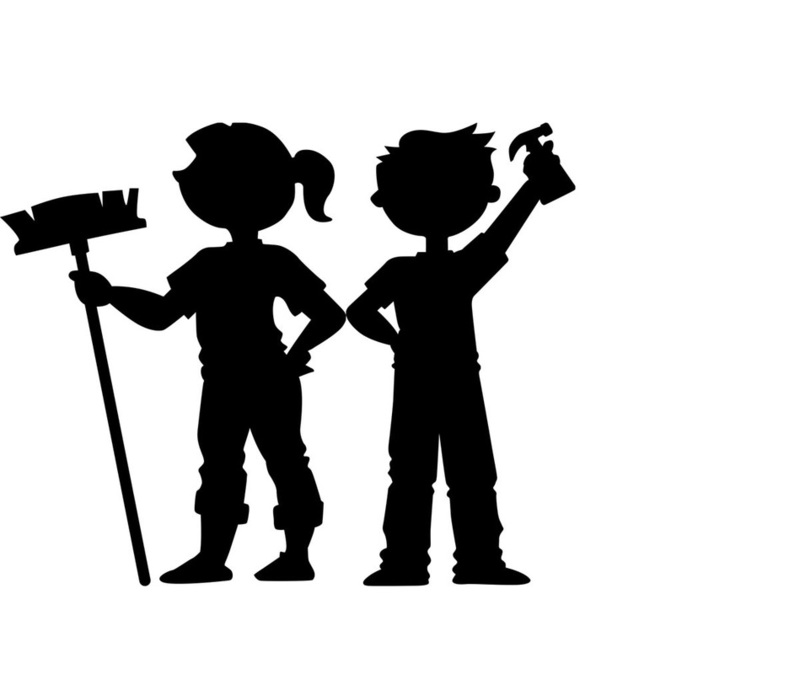 *Tip: Give each child a room to keep clean as their household responsibility. For example: one could have the living room, another the family room, and another the main bathroom. *Tip: You could even use the extra included perforated labels and title one ZONE for each child. This would be there ZONE of the house that they are responsible for keeping picked up. There are several extra perforated labels included with each chore chart system. Have more than 3 kids - no problem. NEATLINGS can handle it. Simple add more self care chore decks. 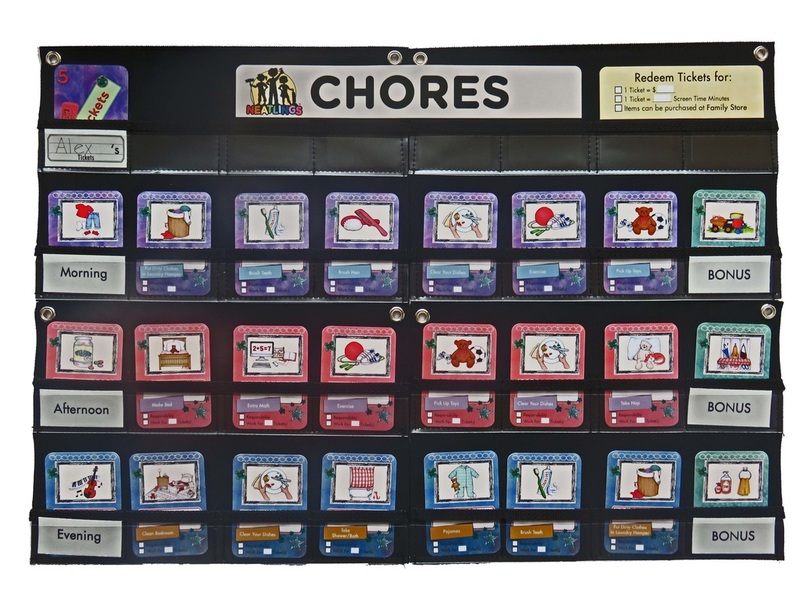 Also has a slot for chores that the child can earn tickets for. Bonus chores are listed at the bottom of the chart. 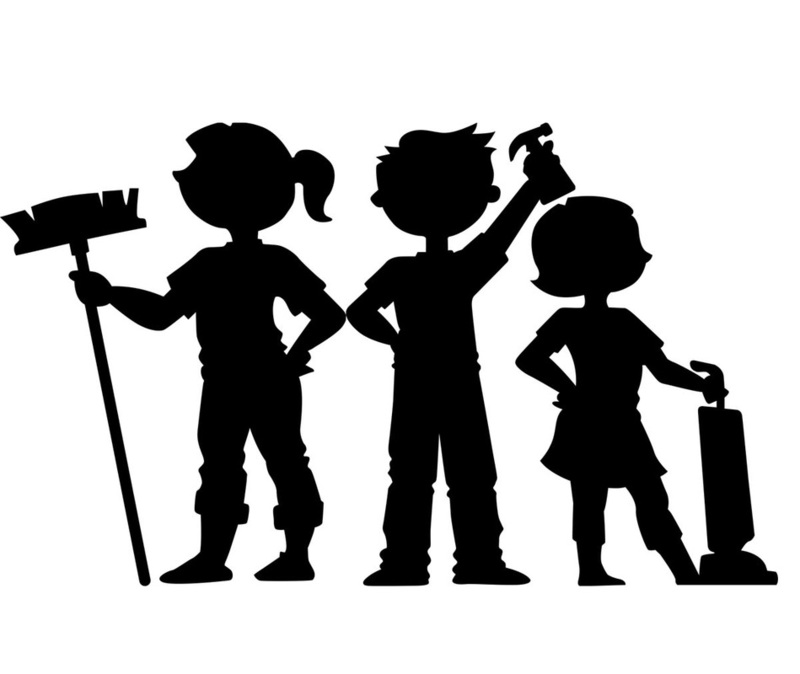 *Tip: You can easily expand NEATLINGS Chore Chart System for 1-3 kids to work for 4 or more children. 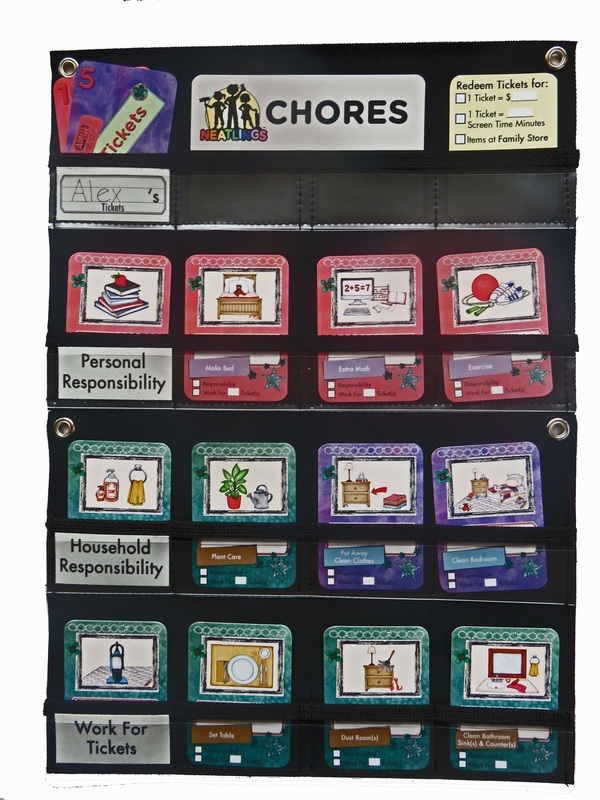 You could purchase an additional system to connect or simply buy another Self-Care Chore deck and use the extra perforated labels to create labels for a fourth child. Have more than 3 kids - no problem. NEATLINGS can handle it. Simply add more self care chore decks. Bonus chores are in a slot at the top of the chart. 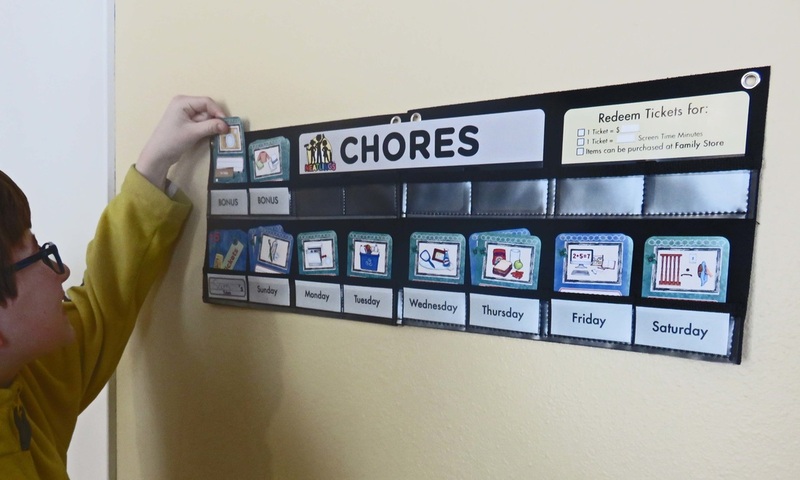 *Tip: You can easily expand NEATLINGS Chore Chart System for 1-3 kids to work for 5 or more children. 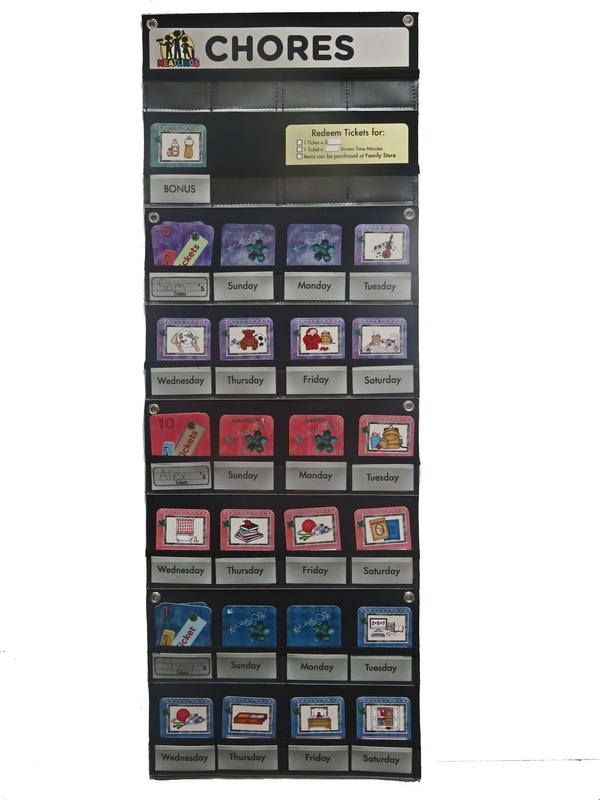 You could purchase an additional system to connect and have a wider chart with more slots or simply buy two additional Self-Care Chore decks and use the extra perforated labels to create labels for a fourth and fifth child. Bonus chores are on bottom row. Chart configuration fits on standard size doors - in case you are short on space. This configuration is 25 inches wide by 35 inches high. First five chores are Personal Responsibilities, sixth chore slot is for household responsibilities, and the final slot is used for chores Work for Tickets. Just think how clean and organized your home will be with 6 helpers! 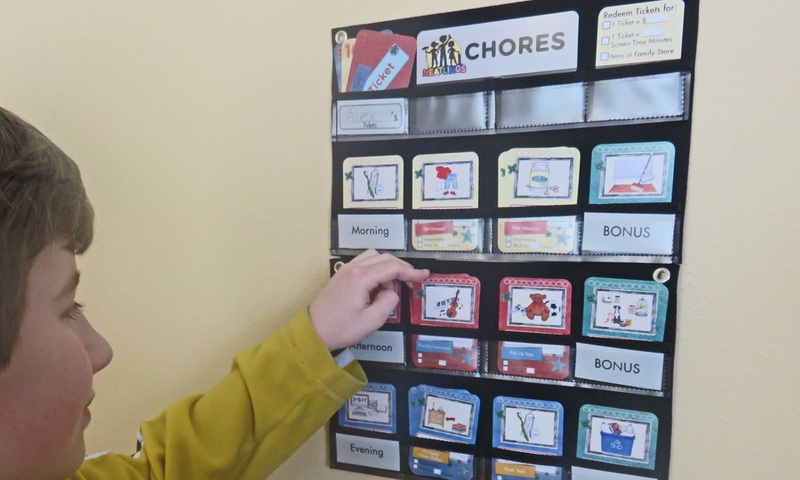 *Tip: Place each child's row in of chores according to height so your tallest used the highest slots while little ones can have the lower slots. *Tip: With each child having their own self-care and ticket cards this system is self-policing. A child won't be tempted to "borrow" reward tickets from a sibling. 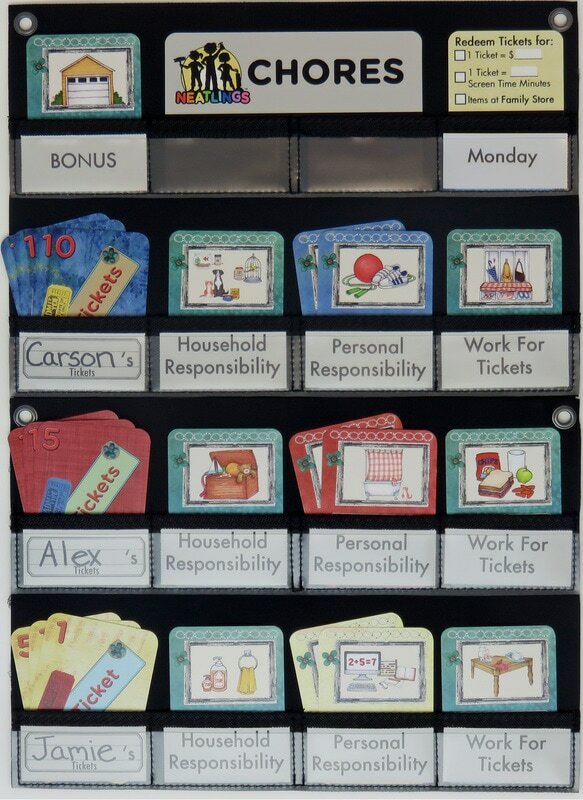 *Tip: Use the Work for Ticket pocket label to reserve extra chores for each child. This allows you the ability to reserve an age appropriate chore for each child. For example your youngest can get the mail while your oldest can clean the microwave.